Forkhead box protein K1 is a protein that in humans is encoded by the FOXK1 gene. ↑ Katoh M, Katoh M (Jun 2004). "Identification and characterization of human FOXK1 gene in silico". Int J Mol Med. 14 (1): 127–32. doi:10.3892/ijmm.14.1.127. PMID 15202027. ↑ "Entrez Gene: FOXK1 forkhead box K1". Tsai KL, Huang CY, Chang CH, et al. (2006). 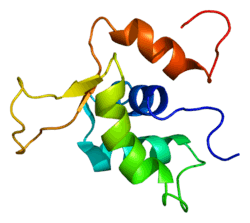 "Crystal structure of the human FOXK1a-DNA complex and its implications on the diverse binding specificity of winged helix/forkhead proteins.". J. Biol. Chem. 281 (25): 17400–9. doi:10.1074/jbc.M600478200. PMID 16624804. Huang JT, Lee V (2005). "Identification and characterization of a novel human FOXK1 gene in silico.". Int. J. Oncol. 25 (3): 751–7. doi:10.3892/ijo.25.3.751. PMID 15289879.